Panther Families Update: One sleep left until the 2018-19 school year begins. It has been an incredibly busy weekend finalizing all of the preparations as we look forward to welcoming the first classes ever in our K-12 community school setting. The following is a list of helpful reminders for our school community in order to allow our learning space to be productive, safe and maximize opportunity. All Secondary students will enter/exit through Entrances A, B, C1 and W.
Elementary bus students will enter/exit through Entrance D until the new handrail is installed on Entrance C—at that time, it will become the main entrance for elementary students. Parents dropping off elementary students may do so at Entrance E—also known as our ‘Kiss & Drop’ or at the main office through Entrance A. Please refer to the map and photos included for more detail. We are fortunate to have a significant number of new registrations joining our Panther family throughout all grades and we have spent the weekend balancing classes. Classroom teacher assignments for elementary will be shared on the first day. Students will be greeted from the bus and directed to gathering areas as previously described. Should it be raining in the morning (and the weather looks perfect now), we will have our students who plan to gather outside relocated to the cafeteria for to meet their teachers. Secondary timetables will be distributed in homerooms. 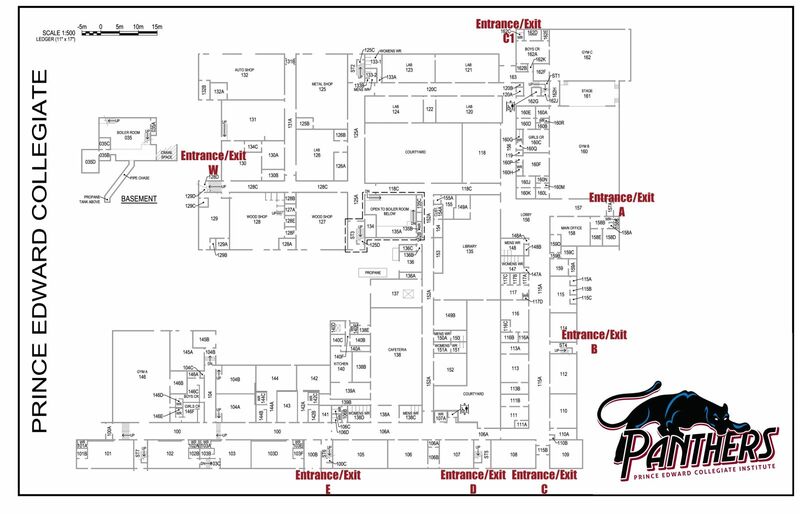 Students may locate their homeroom from walls either outside the main office OR outside the cafeteria by the staffroom. Parking will be extremely limited this year and by parking permit only in order that we have adequate room for staff. There will be a few Student Parking spaces on campus and those will be assigned by application/need only. Parking Permit applications will be available at the main office and online beginning the first day of classes. Students are encouraged to take the bus those who must drive are encouraged to park across at the Community Soccer field lot for the first week of school while the improvements to the parking lot are completed and as we work through the assignment of permits. Vehicles onsite without a pass are subject to being towed at the owners expense. Thank you for your cooperation. We would like to thank ALL of our staff and entire school community for all of their collective investment in ensuring the New K-12 Prince Edward Collegiate Institute has a fantastic start to the school year. We look forward to our new beginning tomorrow.